Carlsbad is an affluent seaside resort city occupying a 7-mile (11 km) stretch of Pacific coastline in northern San Diego County, California. The city is 87 miles (140 km) south of Los Angeles and 35 miles (56 km) north of downtown San Diego and is part of the San Diego-Carlsbad, CA Metropolitan Statistical Area. It is bordered by Oceanside to the north, Vista and San Marcos to the east and Encinitas to the south. Referred to as “The Village by the Sea” by locals, Carlsbad is a tourist destination. In March 1999, Legoland California was opened. It was the first Legoland theme park outside of Europe. 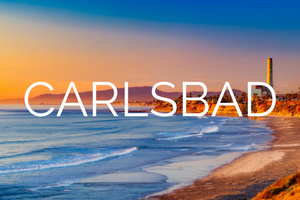 Carlsbad’s core industries include information technology, video game development, manufacturing, robotics, medical devices, life science, wireless technology, clean technology, action sports, tourism, design development and real estate. In 2013, Google named Carlsbad the digital capital of California with the strongest online business community. Carlsbad is home to the nation’s largest desalination plant. Construction of the $1 billion Carlsbad Desalination Plant at the Encina Power Plant was completed in December 2015. Carlsbad has a semi-arid Mediterranean climate and averages 263 sunny days per year.